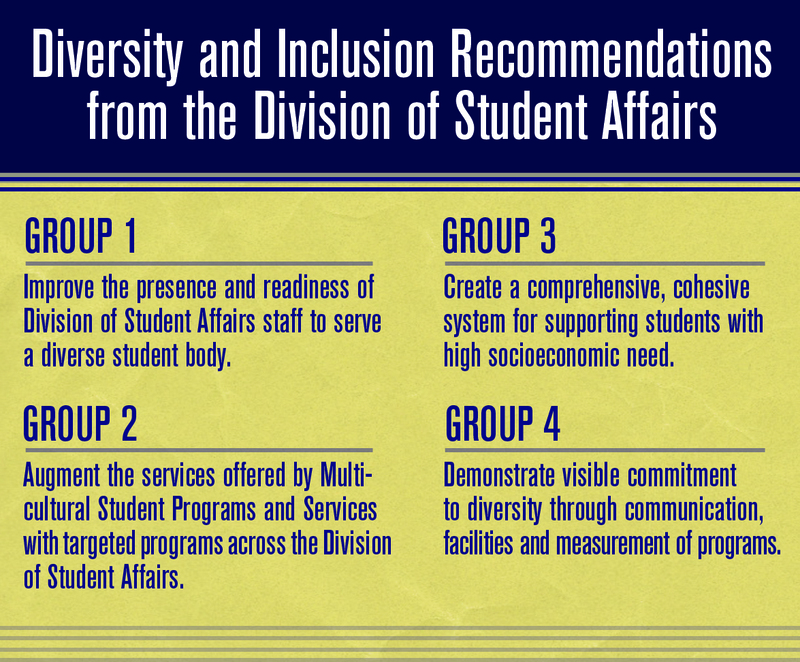 The Division of Student Affairs issued a list of 21 Diversity Recommendations this week, working within the President’s Oversight Committee on Diversity and Inclusion chaired by University President Fr. John Jenkins. Vice President for Student Affairs Erin Hoffmann Harding said the initiatives came out of research conducted by Matthew Storin, senior project specialist for Student Affairs. His work consisted of 138 interviews conducted this year, including 97 with students. Storin’s research was prompted by survey data on student satisfaction with campus life, Hoffmann Harding said. “Our undergraduate seniors tell us that they have a terrific overall undergraduate experience, better than [at] our peer [institutions] which are some of the most selective in the country, and that is a result that you see regardless of ethnicity,” she said. “We’re very proud of that from an institutional standpoint. Storin said the most concerning finding to come out of his research was the indication that many minority students feel like they are the “other” on campus. “[Minority students] often feel that they are not having the same full, enjoyable experience that they feel the white majority students are having, those who might have been raised in a Notre Dame tradition and always wanted to come here,” he said. Many white majority students interviewed in the study expressed support for the concept of diversity and an increasingly diverse student body, but said they were not actively engaged with the issue or engaged in getting to know students different from them, Storin said. He said there were “inspirational” exceptions, however, of students in the white majority who felt passionate about improving the situation. The most optimistic conclusion to emerge from the research was the sense of community built into the Catholic and academic environments at Notre Dame, Storin said. “The figures show that we could probably make an argument that we have the strongest sense of community of any campus in the country,” he said. “So that’s a good foundation on which to build if we’re going to have programs and initiatives to direct more attention to engagement with people not like ourselves. Hoffmann Harding said the 21 recommendations from Student Affairs fall into four groups, and responsibility for acting on each recommendation has been assigned to a member of her senior team who will report directly to her. The first group focuses on internal training within Student Affairs to be ready as a staff to serve a diverse student body, she said. This will include recruitment, retention and development efforts within the Division, with the goal of providing students with role models in the administration who might share their backgrounds and staying attentive to the diversity of the Division staff. The second group is aimed at students and addresses ways to augment and supplement support the work done by Multicultural Student Programs and Services. The third group of recommendations will seek to create a more effective support system for students with high socioeconomic need, including revised advertising, parameters and available resources in the Rector Fund and evaluating the level of support needed for students staying on campus for breaks. “We need to do a little more benchmarking … to design some programs that will be very intentional and thoughtful about the communication and the services that we provide,” Hoffmann Harding said. The fourth group will seek ways to demonstrate a visible commitment to diversity on campus with symbolic reminders, facilities and communication strategies. “[We need] to think about this not just in terms of programs that we do but also in what we say both verbally as a Division … and what we see here on campus,” she said. “I’ve been struck often by how readily apparent it is that Notre Dame is Catholic. We have a crucifix in every classroom. We have the beauty of the Grotto, the beauty of the Basilica. More immediate goals within this group include having a diversity statement posted in every residence hall by the end of the semester and instituting a new Student Affairs undergraduate leadership award recognizing commitment to diversity and inclusion, beginning this year. Hoffmann Harding said while the project began with a focus on ethnic diversity and minority student experiences, she hopes the project will engage all students and foster appreciation for each individual’s contributions to campus. “I think it’s a misconception in many ways [to say] that there is one difference that defines us, like race,” she said. “I think each and every individual student brings a different set of talents, a different set of interests and a different set of experiences to campus. He said the complexity of the issue means that it won’t be solved immediately, but conversation and feedback, particularly from students, will ensure continued progress. Hoffmann Harding said she and her colleagues would remain open to student feedback. Hoffmann Harding said she and Storin presented the recommendations to the President’s Committee and this set of initiatives is just one dimension of the work done by the different subcommittees. “This effort is so important to our mission as a University and for all of your experience as students,” she said. “It’s something that we take extraordinarily seriously and that we think really does derive from our mission to have every student feel welcome, to have a great experience here and to feel safe and comfortable coming to us. Editor’s Note: Ann Marie Jakubowski and three other Observer editors were interviewed by Storin as a group during his research process, but not to an extent that would constitute a conflict of interest.